The Empire has held Threepio captive for far too long. There’s no way they are prepared to deal with this rescue. That’s right – Artoo is ready to take action! 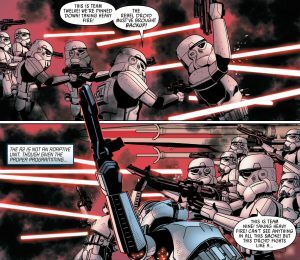 Star Wars #36 continues the character-centric storylines. Writer Jason Arron focuses on R2-D2 and his solo adventure to rescue C3PO. Arron uses an awesome narrative device to walk us through R2-D2’s rescue attempt by using, what we can only assume, is the owner’s manual one would get with an R2 unit. We read the limitations and general working functions of an R2 unit that fall in direct contradiction of what R2 is doing on the page. The juxtaposition of the two is unique and entertaining. R2-D2 is a one droid wrecking crew all the while the Empire and it’s overmatched Stormtroopers only recognize R2 as a droid strictly designed for starship maintenance and navigational assistance. It’s a brilliant tactic by Aaron and it creates a fun atmosphere of misdirection and underestimated ideals of what a droid is capable of doing. 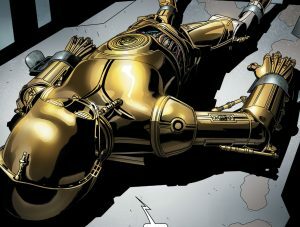 C3PO remains held by the Empire and when we finally see him on the page Aaron does a great job with the bickering banter between the two droids amidst the chaos of trying to escape the ultimate clutches of Darth Vader. While this issue could easily be looked at as a one off, by the end of the issue we finally get some more players on the board and ramp up to a bigger story. We haven’t seen Vader’s elite Scar Squadron in a while so throwing them back in to the mix along with Vader is an welcome touch. It’ll be interesting to see where the story heads now that we are back with a full cast of characters. I have had my issues with Salvador Larroca’s art in the past and the photo realistic faces on some panels still throw me off a bit. But I can see their value and interest for others. Just not my cup of tea in this format. I will say the close-up panel of Luke in his cockpit is all around exceptional. That said, I really do like the rest of the issues artwork. The action sequences are great, the droids look spot on and working in such a drab environment of a Star Destroyer, Edgar Delgado’s color work really pops between the gray tones of the Empire and the bold colors of the droids and rebellion. 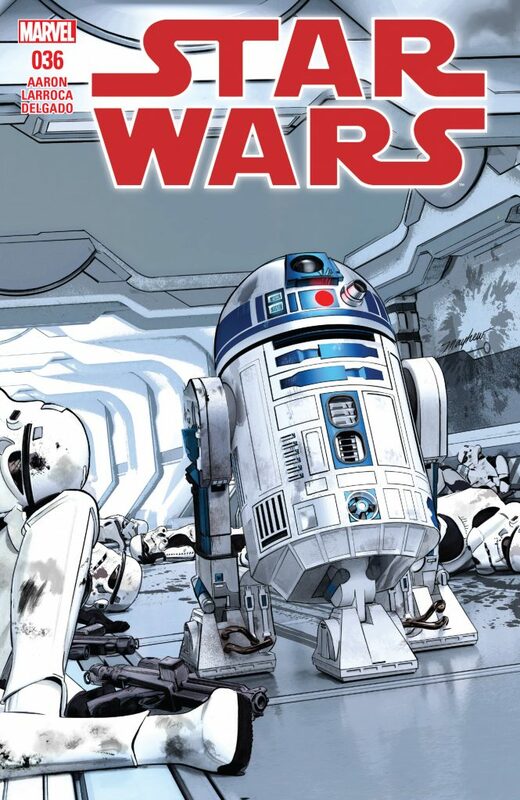 Star Wars #36 mixes plenty of action with a very comical rescue by deception, sprinkled with plenty of pedestrian language about the R2 series Astromech’s “true” operations to accentuate the narrative. Very well laid out and creative use to tell the overall story. Aaron has done a great job with what has been essentially one-shot stories but now that we have all the details I’m very interested with what the bigger picture holds!